The massacre of Canudos In 1897 is a pivotal episode in Brazilian social history. 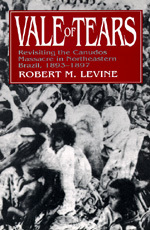 Looking at the event through the eyes of the inhabitants, Levine challenges traditional interpretations and gives weight to the fact that most of the Canudenses were of mixed-raced descent and were thus perceived as opponents to progress and civilization. In 1897 Brazilian military forces destroyed the millenarian settlement of Canudos, murdering as many as 35,000 pious rural folk who had taken refuge in the remote northeast backlands of Brazil. Fictionalized in Mario Vargas Llosa's acclaimed novel, War at the End of the World, Canudos is a pivotal episode in Brazilian social history. When looked at through the eyes of the inhabitants of Canudos, however, this historical incident lends itself to a bold new interpretation which challenges the traditional polemics on the subject. While the Canudos movement has been consistently viewed either as a rebellion of crazed fanatics or as a model of proletarian resistance to oppression, Levine deftly demonstrates that it was, in fact, neither. Vale of Tears probes the reasons for the Brazilian ambivalence toward its social history, giving much weight to the fact that most of the Canudenses were of mixed-race descent. They were perceived as opponents to progress and civilization and, by inference, to Brazil's attempts to "whiten" itself. As a result there are major insights to be found here into Brazilians' self-image over the past century. Robert M. Levine is Professor of History and Director of Latin American Studies at the University of Miami. He is author of numerous books on Brazil and Latin America.